Summer is here (!) and it’s nearly the first Saturday of July, so that means it’s nearly time for Messy Church. We’re continuing to look at Paul’s dramatic life in the book of Acts. This month is “Paul in Prison”. It will be our usual mix of Fun, Faith and Food for all ages, with craft activities, stories, songs and a hot meal to finish. So please join us at St Catherine’s on July 2nd, starting at 3:30pm. 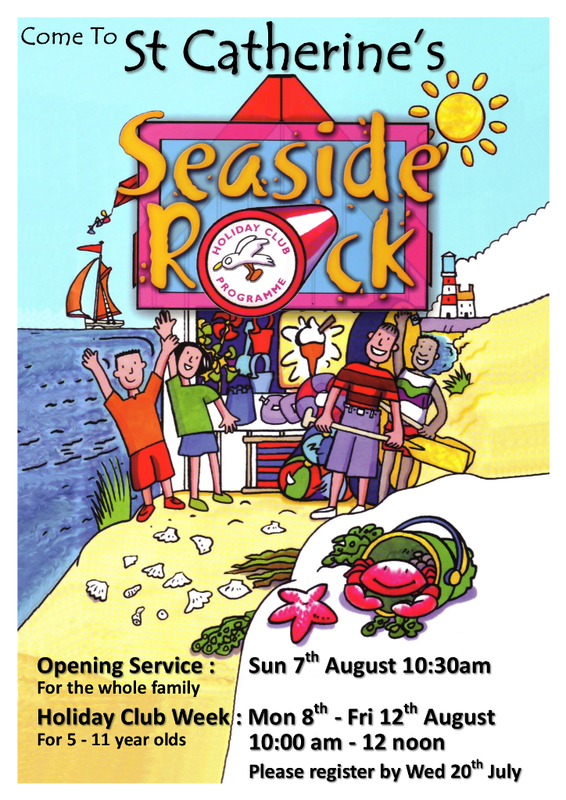 This year’s Summer Holiday Club is “Seaside Rock”. It is set at the seaside where we hope to enjoy all the excitement of the beach with five fun-filled days of games, craft, music, drama, fun and laughter. We’ll also hear through Gospel stories, how Peter (the Seaside Rock) took up the challenge to follow Jesus. Registration is now open. See the magazine, or click here, or contact us here for more details. 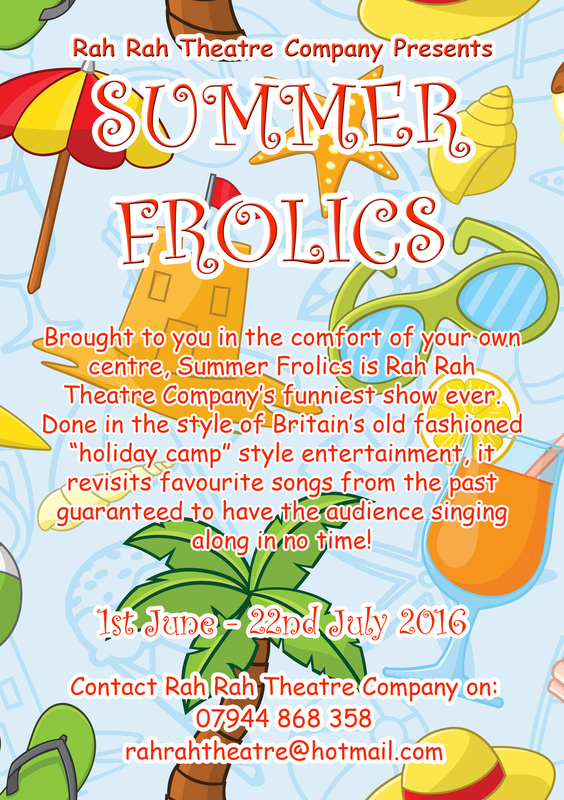 At Friday Friends, on 24th June, the Rah Rah Theatre will be visiting St Catherine’s to present another of their hilarious productions – “Summer Frolics”. £3.50 to include the usual delicious refreshments. All are welcome – please come and join in the fun. Friday Friends starts at 2pm, but why not come for lunch in the Café, The Café opens at 8:45am, with the lunch menu starting at 12noon. 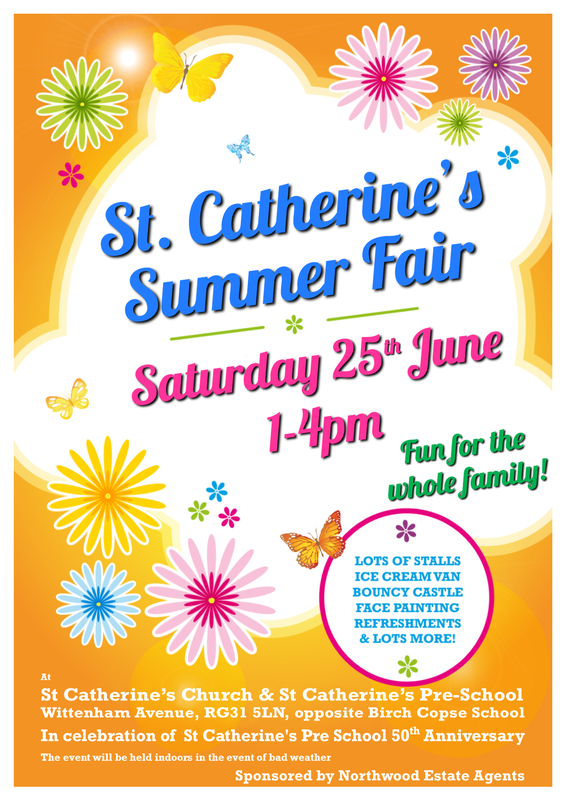 St Catherine’s Summer Fair – Sat 25th June 1-4pm. Please join St Catherine’s Church and St Catherine’s Pre School for their joint Summer Fair on Saturday 25th June, 1-4pm. St Catherine’s Pre School are also celebrating their 50th Anniversary. Fun for the whole family with lots of Stalls, Ice Cream Van, Bouncy Castle, Face Painting, Refreshments and lots more. 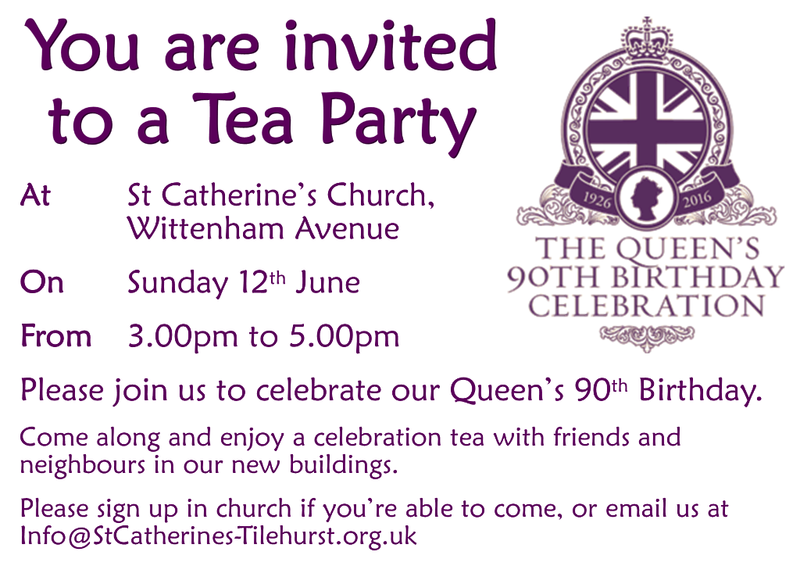 You are invited to a Tea Party to celebrate our Queen’s 90th Birthday, at St Catherine’s Church on Sunday 12th June from 3.00pm to 5.00pm. Come along and enjoy a celebration tea with friends and neighbours in our new buildings. The June issue of RG31 – our Parish Magazine – is now available on-line here or click on the image. 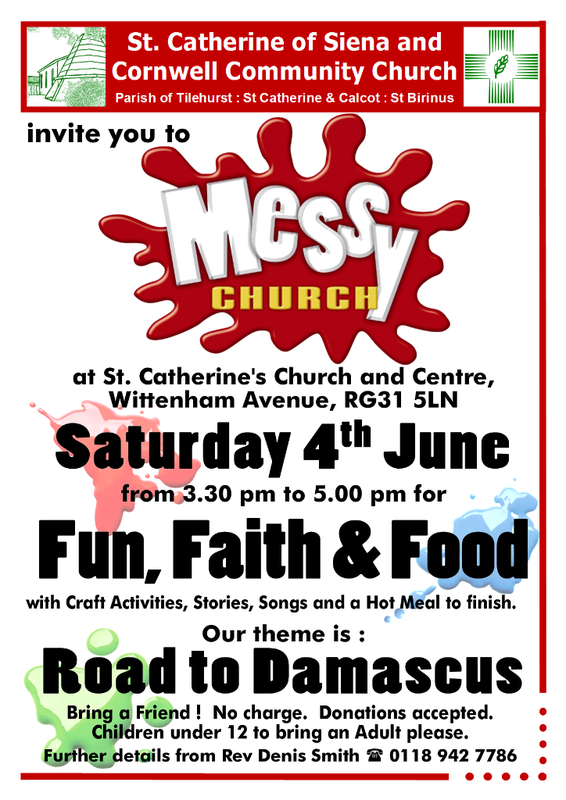 Our next Messy Church is this coming Saturday – 4th June. Our theme is “Road to Damascus”. We’ll be looking at the Bible Story which this commonly used phrase originates from. It will be our usual mix of Fun, Faith and Food for all ages, with craft activities, stories, songs and a hot meal to finish. So please join us on the first Saturday of the month, starting at 3:30pm.